We celebrate two very significant events today – the first is something that I think we all understand, hopefully for better, but I’m not too naive to also understand sometimes for worse – Happy Father’s Day to all fathers and those who are fathers to us in so many beautiful ways. Father’s Day. We understand and know why we celebrate it. Second – a celebration that most of us probably don’t understand quite as well is the Christian Doctrine of the Holy Trinity. So – let’s start with a bit of a church history lesson. The Holy Trinity is one of the earliest doctrines of the Christian church and I believe is one of the most difficult doctrines for followers of the risen Jesus Christ to wrap our minds and hearts around. Some of the earliest reflections on the Trinity that we have are from an early church father named Tertullian in the late second century. Tertullian was seeking to understand and identify more fully who God is. 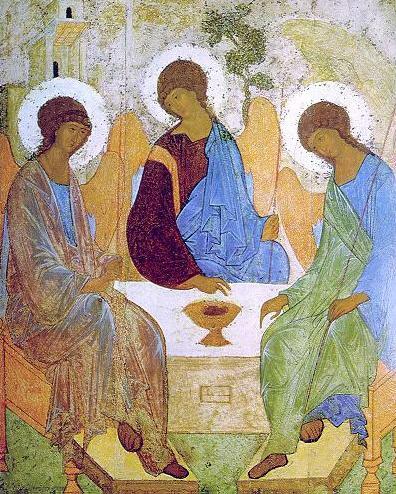 The idea of the trinity becomes more clearly spelled out as a doctrine of the Christian church during the Council of Nicea in 325 and the Council of Constantinople in 381. And finally in 1334, Pope John XXII placed it on the Christian liturgical calendar as the Sunday after the Day of Pentecost. We began our worship gathering today with a very standard greeting that most of us have heard many times before. It is the same greeting that we hear the Apostle Paul offer at the close of his letter to the church in Corinth, “The grace of our Lord Jesus Christ, the love of God, and the communion of the Holy Spirit be with you all.” This is significant because Christian worship does not begin with a simple “Good Morning” or “Hi – it’s good to see you today.” As Christians united in the body of Christ, with this greeting we give to one another the grace, love, and communion of a triune God. Pastor Ruban Duran, the Executive Director of New Evangelizing Congregations for the ELCA, gave a wonderful presentation at the Western North Dakota Synod Assembly in Bismarck a few weeks ago. If you have never attended a Synod Assembly, I invite you to go at some point. It is an exciting experience of being church that will open your eyes in amazing ways that you simply can’t experience fully by only staying within the walls of this congregation. Pastor Ruban is originally from Peru and is one of the most dynamic and exciting people I have ever met. He calls the Holy Trinity – the Three Amigos. He uses the term Three Amigos for the Holy Trinity because he believes that the trinity calls us very deeply into relationship with God. A relationship with God that is not stale or dead. Instead, it’s a relationship with a God who is ever present and ACTIVE in the world, today, right now. Our relationship with God in the Holy Trinity is not a relationship that we have with 2 dead guys and a bird. The Holy Trinity is also a little like the famous Abbot and Costello skit “Who’s on First?” Walk with me through this conversation. When you come to church you need to know the key players…you know, the ones who are worthy of our worship, thanksgiving, and praise. Thanksgiving and praise, huh? Well who are they? OK, now listen closely. There is one God. One God. That seems easy enough. What do you call this one God? Father, Son, or Holy Spirit? I told you, Father, Son, and Holy Spirit. Yes. But it’s only one. I used a wonderful old children’s story about a shark and a whale who are good friends in my Pentecost sermon last week. I think it speaks very well to our reflection on the Holy Trinity today as well. The good friends whale and shark were swimming along one day in the sea enjoying a quiet afternoon when the shark asked the whale, “You are so much older than I, and wiser too. Could you tell me where the ocean is?” The whale smiled gently and said, “The ocean is what you are in now.” The shark couldn’t possibly believe that. “Come on, tell me where the ocean is so I can find it!” The whale repeated, “The ocean is here, now; you are in it.” Still unbelieving, the shark swam away disgusted, still searching for the ocean. Brothers and sisters in Christ – don’t spend too much time looking for God, God is here, now, all around you in the now of your life, dwelling within you, within me, and within the broken world in which we live and this community of faith that we call Good Shepherd Lutheran Church. The Doctrine of the Holy Trinity is not something that we discover only in academic theory and study or by believing that our relationship with God is based on God and me being buddies or not being possible for us until we have the entire history of God’s unfolding creation memorized and placed in a neat little God timeline. The Doctrine of the Holy Trinity places you and me, children of God, in the right now of the world. God with us and for us in the Holy Trinity right now – lifting you and me up when we are broken by anger or hatred or loneliness or death. God with us and for us in the Holy Trinity right now – sending us out to be hands and feet and listening ears to our brothers and sisters in need after rising flood waters have consumed not only their houses, but their homes. God with us and for us in the Holy Trinity right now – bringing restoration and hope to each one of us. May you be broken enough to help one another, for wholeness comes from healing. May you disagree enough to hear one another, for unity comes from listening and forgiveness. May you be lonely enough to hold one another, for touch defeats division and hatred. In the grace of our Lord Jesus Christ, the love of God, and the communion of the Holy Spirit we are claimed as children of God. Let us give thanks and praise for the gift of the Holy Trinity. This entry was posted on Tuesday, June 21st, 2011 at 1:51 am	and posted in Recent Sermons. You can follow any responses to this entry through the RSS 2.0 feed.